The Society has examples of almost every early plat map or atlas published for Wisconsin for both pre- and post-Civil War. Wisconsin land ownership maps and atlases identify local landowners of a county, and provide information about its topographic and cultural features. They were compiled from local land records and supplemented with the mapmakers' own surveys. These maps and atlases were commercially produced based on supply and demand within the geographical area. Publishers often referred to these as "plat maps" or "plat books." 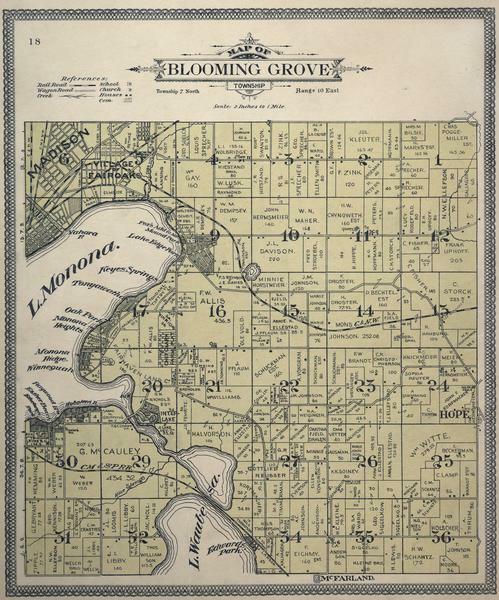 The earliest plat map for Wisconsin was published in 1857. Land Ownership Maps and Atlases are exceptional research tools for local historians, genealogists, and urban and environmental historians. The Society continues to collect current atlases. Land ownership maps and atlases are arranged geographically by county, then chronologically by date. Guides describing the land ownership maps and atlases of Wisconsin communities are available in the Archives Research Room. It is helpful to know the approximate date and location you are looking for prior to searching the Archives. Pre Civil War land ownership maps were usually wall maps. They noted a county's landowners and were embellished with illustrations of buildings such as courthouses, businesses or homes of the wealthy, directories, and city maps. Wall maps were usually quite large, measuring as much as four feet square. County atlases became more popular after the Civil War. Atlases were smaller, easier to handle, and allowed for the addition of many more features. You can find lists of patrons, biographical sketches and portraits of local landowners, illustrations of farms and businesses, and city maps. Post Civil War atlases complement township maps. 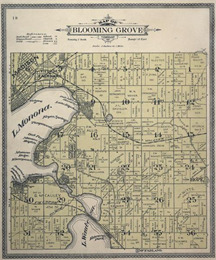 Township maps show the boundaries and acreage of farms, locations of churches, cemeteries, schools, quarries, cheese factories and other businesses. The township maps also show roads and railways, and topographical features such as rivers, lakes, marshlands, and hills.